This set of 8 uses the same snag free construction as our other Soft Loop markers and has 6mm multi-colored (lt and dark green, lt and dark blue, orange, dark purple, dark pink, and white) cats eye glass beads mounted on silver colored wire. Our markers are made to fit your needles, unlike the "one size fits all" type and are totally snag free because there is no sharp crimp cover edge at the bottom of the marker (we use a small silver plated bead). 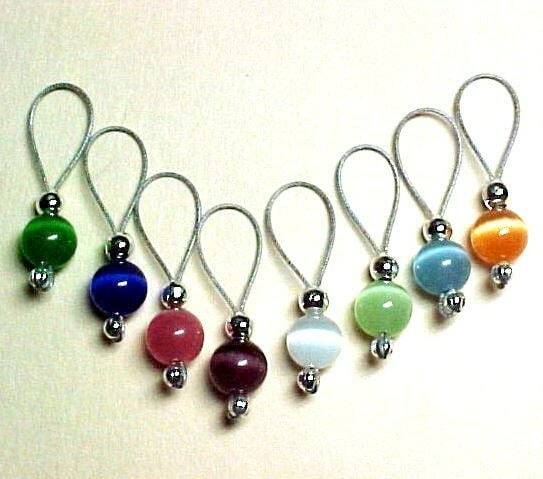 Absolutely love these stitch markers!